Deadline to submit ideas is August 31, 2019. To celebrate the present we will be sending objects from this year into the future. As part of the Town of Peace River’s Centennial Celebrations, we are putting together a time capsule to celebrate our 100th year, to be sealed at the end of this year until 2069. It will be opened in 50 years during the Town’s to be open during our sesquicentennial year. The time capsule will document and celebrate the town in 2019. What will go inside the capsule? 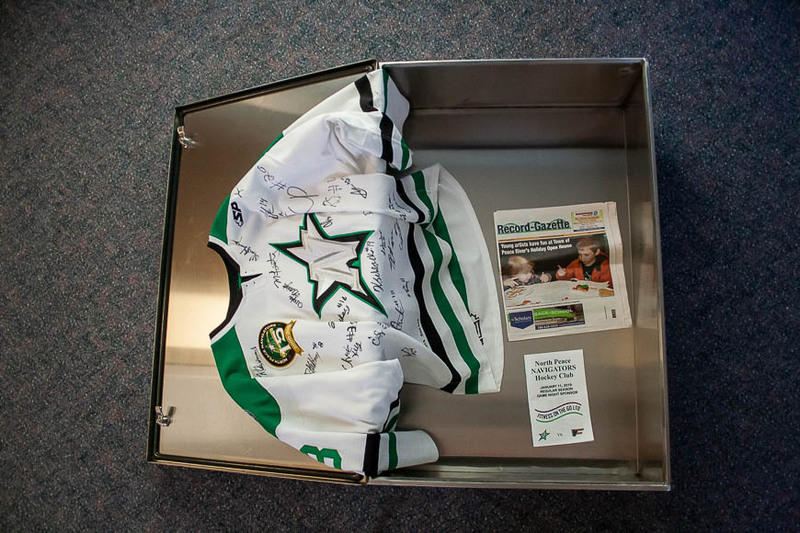 To get things started the committee has already added, a North Peace Navigators jersey signed by this year’s team, a program from the Navigators first game in 2019, and a copy of the Peace River Record Gazette’s first issue for 2019, pictured above. We are looking for more items to place in the capsule and are asking the community to submit ideas. Items must be related to the community of Peace River and the year 2019. For example, a non-profit group hosting an event this year could submit an event poster. No large or bulky items, less than 2 lbs. and smaller than 12”x12”x6” as space is limited. Items must be freely given and become the property of the Town of Peace River upon acceptance. Items can be objects, photographs, or documents. The Centennial Committee has the final say on which items will be included. We are currently accepting submissions, the deadline to submit your idea is August 31, 2019. Please note, the time capsule project is focused on celebrating our present, not the past 99 years. Historical items are not the focus of this time capsule, we are looking for items that represent Peace River in the present 2019. In order to get your submission to the Centennial Planning Committee for review please fill out the form below. Right now we are requesting only photos of the items and/or descriptions. Once we have selected which submissions will be included the Committee will contact the successful applicants. This information is being collected for the purpose of accepting submissions for a time capsule under s.33(c) of the Freedom of Information and Protection of Privacy Act. All personal information will be managed in compliance with the provisions of the FOIP Act. Questions about the collection of this information can be directed to the Director of Corporate Services (780) 624-2574.